Travelling isn’t something many cats enjoy. In fact, being away from their home territory can be very unsettling, as cats feel particularly vulnerable away from everything they know. Cats, by nature, love routine and hate change, so the process of being moved is going to be stressful. Unfortunately travelling can’t always be avoided, such as when you’re moving house or going to the vets, but there are things you can do to keep the stress to a minimum. Choose a suitable carrier – make sure there is enough space for your cat to stand up, turn around, and move about in. 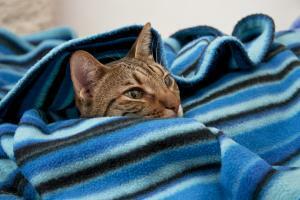 Place a blanket inside to keep your cat warm and comfortable. Ensure the carrier has sufficient ventilation and secure it with a seatbelt in the car. After being used once or twice, your cat is going to associate the carrier with travelling – usually to the vets – and may develop an aversion to it. Try to resolve this by making it a cosy, familiar place by leaving treats inside for your cat to find and spraying with Feliway – a pheromone-based product which will make your cat feel safe and confident. Keep journeys short – cats will feel vulnerable if they can’t use the litter tray as and when they need it or escape to somewhere safe and high up when they feel threatened. For this reason, try to keep journey times to a minimum. If you need to travel further afield and you know your cat is an unhappy traveller, consider asking your vet about calming supplements and sedatives. Don’t feed on the morning of the trip – some cats get motion sickness when travelling, so avoid feeding in the morning in case your cat decides to vomit. For short journeys this won’t be a problem but speak to your vet about the best course of action if you are travelling for more than a couple of hours. It may be that he needs to prescribe some anti-nausea medication. Bring water – when travelling in the car, it can be tricky getting the temperature just right. On hot days, it is important to keep your cat hydrated, so take plenty of water from home (cats won’t always drink water that tastes different to what they are used to). Take a harness – just in case something happens and you need to take your cat out of its carrier. Use positive reinforcement – because a kitten’s first experiences of being in the car are usually unpleasant memories of seeing the vet, it’s unsurprising that many come to dread travelling. Counteract this fear by making it a fun and happy experience and positively reinforce calm, content behaviours by giving praise and even the odd tasty treat. Avoid whining back at your cat, who will interpret this as confirmation that there’s something to be afraid of. When cats learn that travelling doesn’t have to be scary and that, actually, it can mean wonderful things for them, you’ll find travelling a much more pleasant and stress-free experience. As always, if you have any advice of your own, please comment below.